The sea is an important resource. It is essential when we work at sea that we protect it by using it sustainably. The main aim of the South Coast REC study was to create reference material for those involved in the management and development of offshore resources, enabling them to make important decisions about how we use these resources sustainably. The South Coast REC study produced regional maps and scientific information detailing the ecology, archaeology and geology of the seafloor. This will help make decisions on how we use the sea, without damaging its natural environment or heritage. This section sets out some of the conclusions made by the ecologists, archaeologists and geologists through their scientific research. It highlights some of the most interesting aspects of the South Coast REC study area, and some of the advice given to help protect our seas for the future. Visit the South Coast REC menu and investigate the ecological, archaeological and geological research results. The South Coast is one of the few places in the UK where you can find the fragile nests of the black bream. Each spring, black bream migrate from the deeper waters of the English Channel to the shallow coastal waters of the South Coast study area, in order to reproduce. The male fish searches for certain types of seabed sediments that are suitable for building their nests. Black bream like to build nests on hard bedrock covered with thin sands and gravel, a habitat that is found in the South Coast REC. The male fish excavates the thin sands and gravels to create a depression or ‘nest’ about 1 – 2 metres wide and 5 – 30 centimetres deep. The female lays her eggs in the nest and the male fertilises them. He will then stay and guard the nest until the eggs hatch. 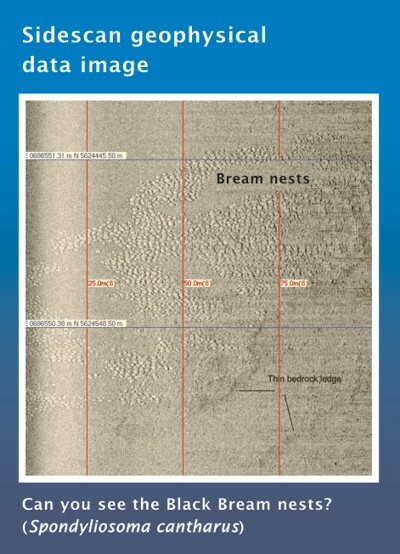 These black bream nests and breeding grounds were first identified in the South Coast REC through the geophysical survey images and ecological samples. However, the nests are very fragile and can be easily damaged both by natural events and by our use of the sea, for example fishing. The information collected by the REC will help us understand how to protect these important areas. Fascinating fact: in their lifetime, black bream are both male and female: when young, they are female but as they grow older, they become males. The South Coast REC study has identified some marine habitats in the area that may require protection by law. Annex I of the European Commission’s Habitats Directive lists habitats that are subject to special requirements for conservation under European Union law. As a member of the European Union, the Habitats Directive also applies in the United Kingdom law. The habitat categories on this list represent key environments that are important to the health and productivity of marine ecosystems. Some habitats play an important role in a sea animal’s life, for example by providing breeding or nursery grounds, while others are homes for fragile or rare seafloor communities. Many marine habitats are under threat from humans’ use of the sea and so require protection. Government selects a representative proportion of habitats to protect, taken from each habitat category on the Habitats Directive list. The new name for these areas will be Marine Conservation Zones, set up under the government’s Marine and Coastal Act 2009. Scientists will monitor these Marine Conservation Zones and many activities that might damage these areas will not be allowed. Ecologists identified a number of habitats that fit two of the Annex I habitat categories in different places across the South Coast study area. These categories were sandbanks and rocky reefs, with the possibility of one biogenic reef of mussels. The REC findings on the distribution of different marine habitats will help inform government decisions on establishing Marine Conservation Zones in this area. Geologists studied and mapped ancient river systems in the South Coast REC study area. Today, they remain as channels in the seafloor and are often filled with seafloor sediments. Located to the south-east of the Isle of Wight, the palaeo-Solent is one of the most important channel systems in the area. It runs for over 10 kilometres, and varies in width from less than 1 kilometre to more than 3.5 kilometres. Sometimes it is difficult to see the channel because it is completely filled with seafloor sediments. Geologists used information gathered from the geophysical survey to map the course of the palaeo-Solent River. In particular, they can use sub-bottom profiler data to see the shape of the channel, even when it is full of seafloor sediments. The results showed that this river was a tributary into the Northern palaeo-valley river system that flowed between Britain and the rest of Europe before the end of the last Ice Age. It also changed course over time. It is important to remember that the landscape changed over the Ice Age, with the sea level rising and falling. Studying these changes can help us understand the effects that our changing climate will have on us today. 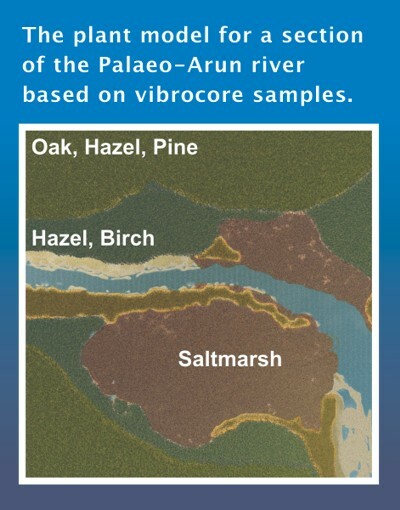 In a previous MALSF-funded project, Wessex Archaeology reconstructed the ancient landscape of the palaeo-Arun, one of the three ancient rivers located in the South Coast study area. 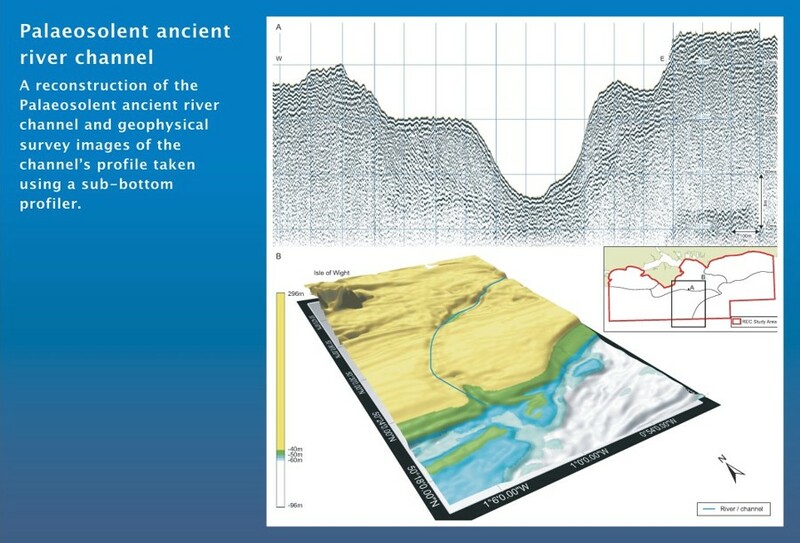 Like the palaeo-Solent (see above), archaeologists used geophysical survey data to map the course of the ancient palaeo-Arun River, creating a 3D model. This model forms the foundations for reconstructing the past landscape. You can watch the animation of the reconstruction below. Archaeologists collected vibrocorer and grab samples of seafloor sediments above and below the seafloor surface to study environmental remains. This enabled them to reconstruct the environment from 9,000 years ago, during the Mesolithic period. The samples showed that the top of the river valley consisted of mixed hazel, oak and pine woodland, while at the bottom there was marshland. Using archaeological data collected from past excavations, they were able to reconstruct a picture of the people that lived near this river and activities that took place there, during this period. Watch the animation to see the results. The gravel terraces of these river valleys are dredged for building material, or ‘aggregate’. It is important when these areas are dredged to be aware of their archaeological importance. The REC studies identify areas of potential archaeological importance. This allows measures to be put into place to record and preserve any archaeological material discovered, which adds to our knowledge and understanding of these submerged and ancient landscapes. One of the most significant shipwrecks discovered is the SS Mendi, which lies to the east of the Isle of Wight in the South Coast study area. The SS Mendi was a cargo steamship launched in 1905 on the River Clyde. Owned by the British and African Steam Navigation Company, she transported cargo and passengers on the Liverpool to West Africa cargo route. In World War I, the Mendi was contracted to the British Government for war service, working as a troop transportation ship. During the war, Africans joined the British army as non-combatant forces that supported those fighting on the frontlines. On the night that the Mendi sank she was transporting the 5th Battalion South African Native Labour Corps to the Western Front. In the dark and fog of the night of Wednesday 21st February 1917, the SS Mendi was rammed by the SS Darro. It was an accident, but the SS Mendi sank 25 minutes later and almost 650 men died. 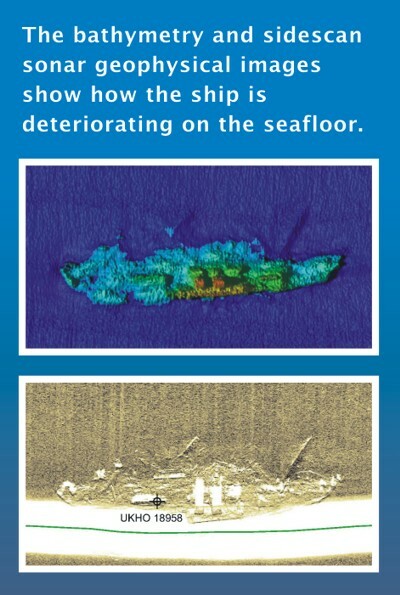 There are concerns about the wreck, as multibeam and sonar geophysical results show that it is collapsing. The site plays an important role in recording the historical links between Africa and the United Kingdom at the turn of the 20th century, through both trade and as allies. The story is famous in South Africa but it is only just gaining public attention in the United Kingdom. The REC highlighted the importance of this site as a focus for further awareness and as a symbol of commemoration for the brave men that died on the ship.